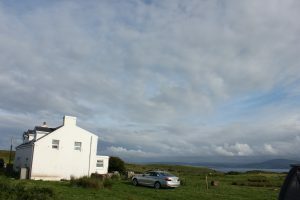 After leaving McQuaig’s, we set out for our lodging, a classic Irish cottage on a hill with a magnificent view of the sound between Rathlin and the mainland. I’m not sure when it was built, but it was clear that the indoor plumbing was a retrofit. The original rooms were very small, but there was a spacious family room, clearly a modern expansion, on the second story with large windows facing the water. The house was surrounded by sheep pasture and the evidence of the sheep was everywhere. We had to take our shoes upon entry so as not to tramp “sheep dip” into the house. It was a perfect place to stay. It made us feel like we belonged.